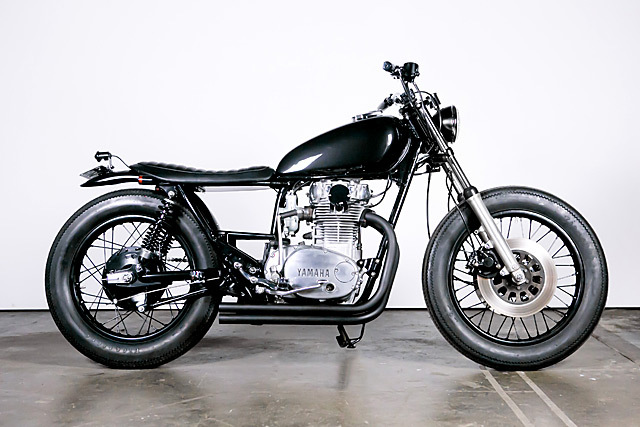 Christian is well-known for his ultra clean Cafe Racers but customer Nick had something a little different in mind. 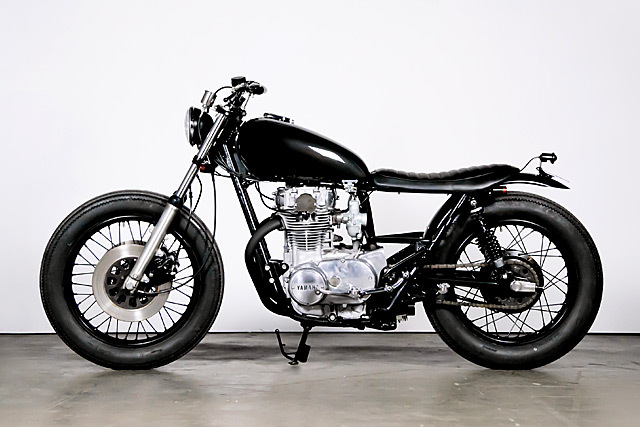 “Nick was after a tracker-esque build, rekindling his youth growing up on a country Victoria farm kicking around on dirt bikes” explains Christian and not one to turn down a challenge he quickly set to work. His task made somewhat easier by the fact that MMCC is a large custom parts supplier with plenty of good gear for such a build. 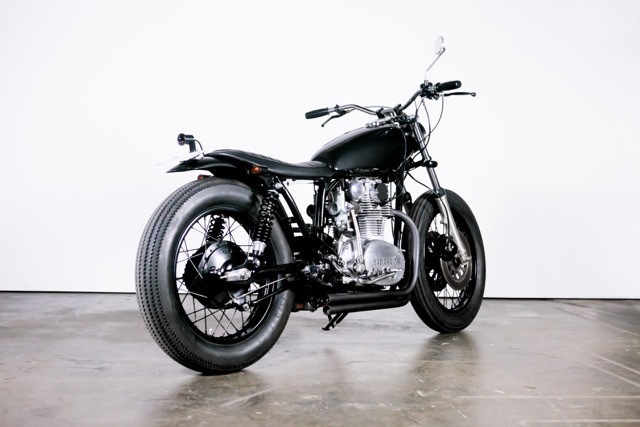 While the Heritage Special makes the perfect base for a Chopper/Bobber build Christian felt the 64-spoke wheels the Heritage came out with had to go, so a swap for the classic 36-spokers was arranged with Australian XS650 guru, Geoff Bamford. With the new wheels fitted up and rolling on period rubber courtesy of the MMCC store the visual of the bike began to take shape. Next on the chopping block was the frame and it was in for some cutting as the rear section of the subframe was removed with a set of bungs fabricated and welded into the exposed tube to later act as indicator mounts. Then back to the parts department for a Nitroheads seat that took some minor tweaks to fit the XS having been originally designed to go on another Yamaha, the ever popular SR model. To finish up the ultra clean rear it was back for another SR designed part with a Daytona rear fender mated up. 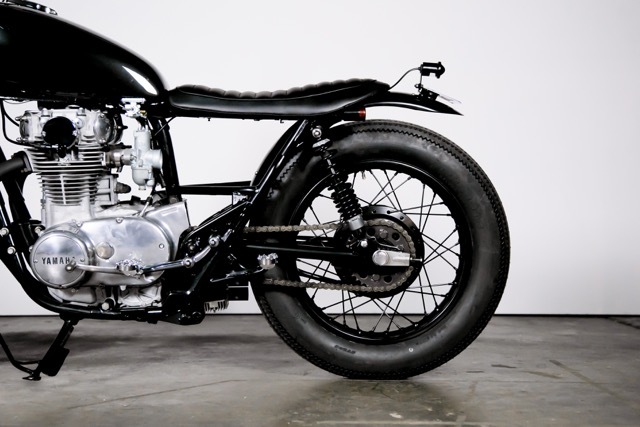 With that the metal work was complete and nothing creates a classic feel like a singular colour across the frame, tank, swingarm and rear fender and black is the perfect hue to juxtapose with the raw metal mechanicals. 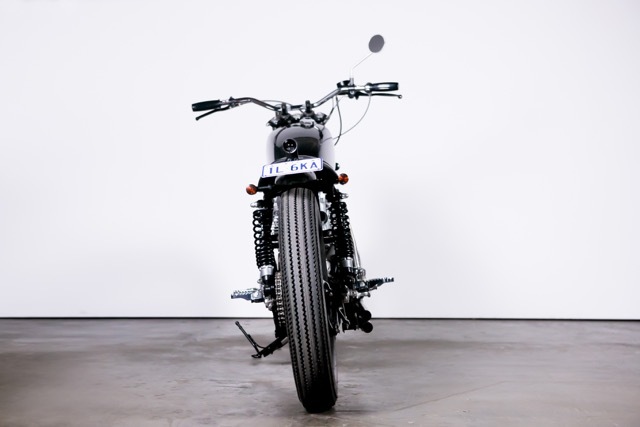 There is no front fender, no side covers or anything at all that serves no functional purpose, just huge amounts of negative space that allows the engine to truly take centre stage. 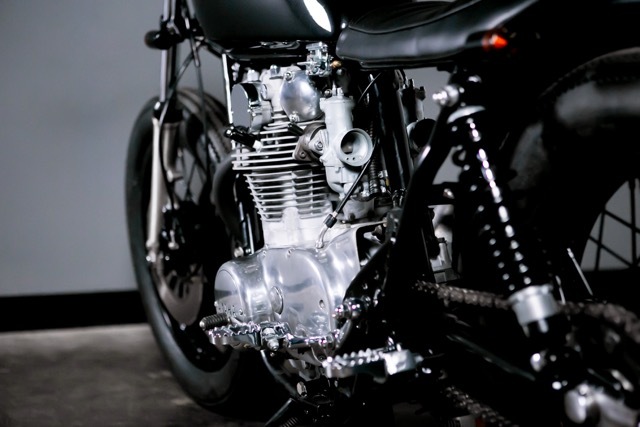 From the factory the XS650 engine is a thing of beauty, it is perhaps the primary reason the model remains so popular today. Yet Christian has a way of taking something already perfected and making it that much better, the air-cooled, parallel twin now just as glorious as the very best of British it was modelled on. One of the secrets to his success is to keep things simple and that starts with the ditching of the Japanese carburettors and the fitment of very Brit and beautiful Amal Concentric MK1’s in their place. The twin pipe exhaust is another lesson in elegant design with the drag pipes built by the now defunct Gordon Scott Engineering, the blacked out pipe work exiting on the right side with 8 inch long baffles to keep the law man happy. For Christian they’re bitter-sweet “Sad to see Scott go… his custom pipe work for the XS was awesome to say the least”. With the engine looking even more sophisticated than the original engineers could ever have hoped for it was time to ditch the dodgy electronics and make sure this prized piece wasn’t stranded by the side of the road. The electronics have all been thoroughly upgraded with some of the best components around for the XS. The troublesome charging system has been shown the door, replaced by the brilliant permanent magnet alternator kit from Hugh’s Handbuilt. With it fitted up and working an entirely new wiring loom was built from scratch with everything routed through the ingenious Motogadet m-Unit. A small 8 cell Antigravity battery completes the setup finding its home in a custom cradle that is hidden under the swingarm. The result is mechanicals that are the best of both worlds, the look and ride of an old classic, with 21st century electronics for the ultimate in reliable usability. To give the XS the stance he had in mind Christian ordered a set of custom Hagon lowered “Slimline” rear shocks built to his exacting specs. At the front of the bike is the original, all be it in mint condition, factory telescopic forks supporting the twin disc brake setup. 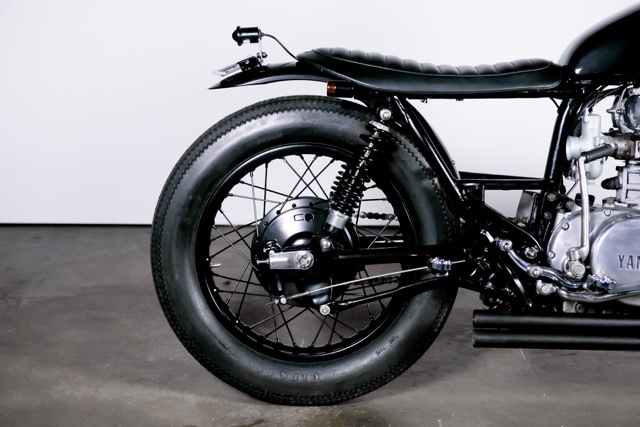 The new bars are as clean and uncluttered as you can make a functional and legal motorcycle with just the required levers, single mirror and master cylinder. The original pegs were ditched in favour of the vintage trials, bear-trap pegs. 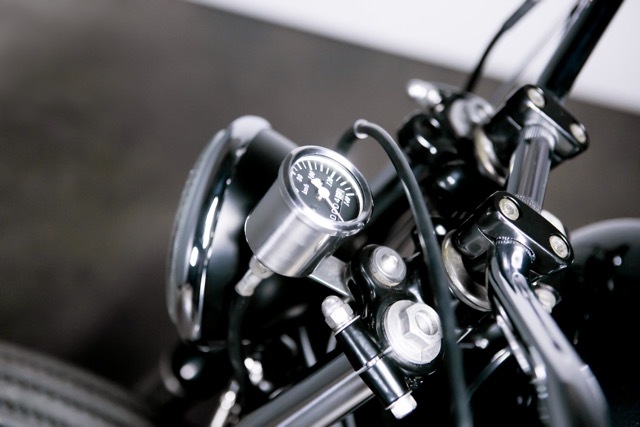 The mounts were modified to suit the XS, then all cast marks were polished out and the pegs were chrome plated. 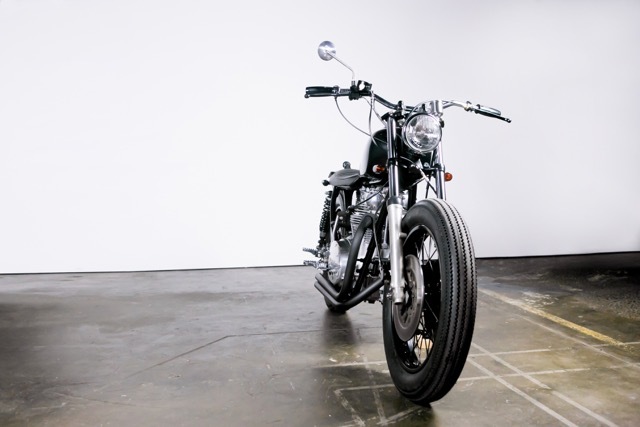 Finishing out the clean look is a small single headlight, with a retro early style taillight mounted on the new rear fender and minimalist indicators with smoked lenses. It’s fair to say that with such a classic ride to climb aboard the only instrumentation that Nick needed was a single speedo, it’s all that’s been fitted and the rest is as it should be, done by the seat of his pants. 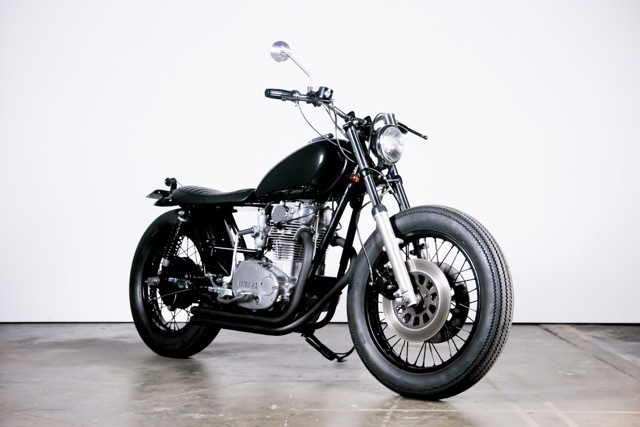 But he could also be the last man to ride an MMCC creation as Christian has hung up his wrenches to focus on managing the three separate parts shops he now runs across the globe in Australia, the USA and Europe. It’s a loss to the Australian custom scene but also the chance for a new group of young builders to step up and fill his large shoes, because you only have to look over this build to see he’s set the bar high.